Car rentals around Miami cruise port cater to the many thousands of cruisers who arrive and depart from Miami each week on a Caribbean cruise. Apart from taxis and airport shuttles, there is no regular public transport for getting around Miami. Consequently, most people opt for car rentals from the port of Miami. There are many reasons why people need a Miami cruise port car rental. Many cruisers find that the best way to reach Fort Lauderdale Airport or Orlando Airport is by picking up a car rental from Miami cruise port and driving to the airport. Some cruisers may want to spend a few days exploring Miami, South Beach and the surrounding area before or after their cruise. They need the convenience and flexibility of a rental car to get to their hotel, and to explore the area during their stay. 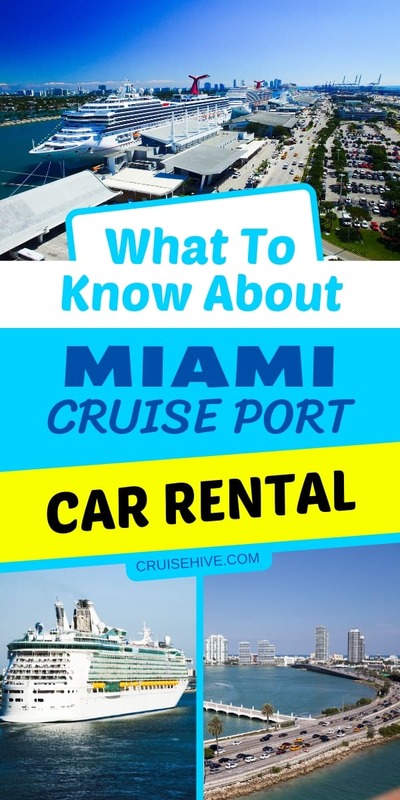 Our guide to Miami cruise port car rental covers all the available options, including a few you have probably never considered, so let’s get started! The port of Miami itself does not have onsite car rental as space is at a premium. However, there are plenty of car rental companies based nearby. From luxury car hire, SUVs and vans to compact and economy vehicles, you’ll have plenty of choice when considering Miami cruise port car rentals. 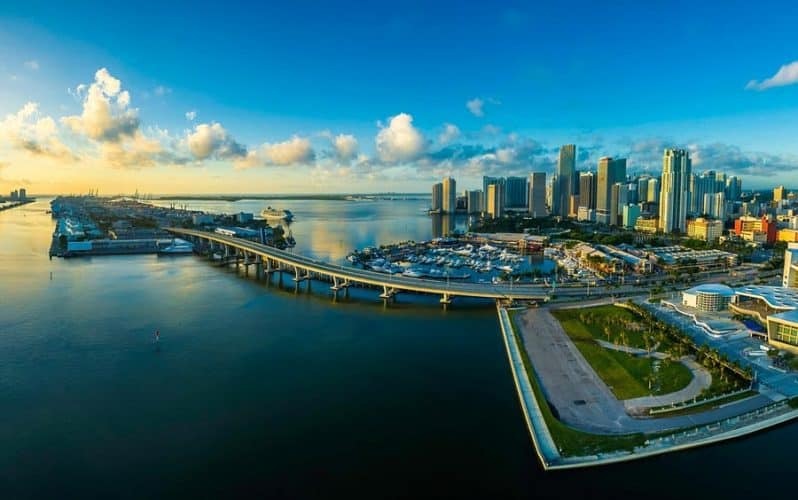 Most of the main car rental companies in Miami have one or more centers close to the port or around Miami International Airport, just 9 miles away. Some car rental companies also have offices on South Beach, just 6 miles from the Port of Miami. However, the closest car rentals to Miami cruise port are in downtown Miami, less than two miles from the port. As well as the national companies, there are several independent car rental companies near Miami port that offer competitive prices. It’s always worth shopping around to get the best price for your Miami cruise port car rental. To get a speedy personal quote, click one of our links below and fill in the details, including the required dates, pick-up and drop-off points. You can also phone car rental offices near Miami cruise port and confirm a price before booking. Bear in mind that there is usually a surcharge for one-way car rentals. That means if you are picking up a car rental near Miami cruise port and dropping it off at Fort Lauderdale Airport, for example, the rental company will add a one-way charge to the daily rate. You may also be charged more for multiple named drivers. By choosing one designated driver, you could save money on your Miami car rental. Many car rental companies charge an airport concession surcharge so it’s worth choosing a car rental office that is off-site for cheaper car rentals. If you book your Miami cruise port car rental ahead of time, you can save money by paying up-front and taking a “no cancelation” option. However, if there is a possibility you may need to cancel your car rental, it’s worth paying a few dollars more to have the penalty-free cancelation option. Insurance options can affect the price you pay for your car rental. Paying a voluntary deductible for damage and declining personal accident insurance can significantly lower the price of your Miami cruise port car rental. Finally, you will need to decide whether you want to return your rental car with a full tank of fuel, or not. If you opt to bring the car back without filling up the gas tank, you usually pay more per gallon, or have a service charge added. You can gamble with the “pick-up full – return low” fixed price, but make sure you don’t run out of gas on that all-important journey to the cruise ship. The cheapest option is to bring the car back with a full gas tank. There are plenty of gas stations close to Miami cruise port, or wherever your drop-off point is, to fill up with gas before returning the car. Most Miami cruise port rental cars come with a SunPass, which makes getting around the city very quick and easy. Many major routes in Miami charge a toll. These include the Florida Turnpike and the Dolphin Expressway, which connects the port of Miami with the airport. Having a SunPass payment facility linked to your credit card or car rental agreement means that you can drive through the toll plazas without stopping. Overhead gantries will scan your SunPass receiver or your car rental registration plate (TOLL-BY-PLATE) and charge the toll accordingly. If your SunPass responder is switched off, or your car rental does not have one, you will need to stop frequently and make the payments in cash or by credit/debit card. On the I-95, SunPass also allows drivers to opt for Florida Express Lanes which will help you avoid getting held up in traffic at busy times. If you have a cruise or plane to catch, using these optional express lanes is recommended. The tolls are 50 cents and up and they are charged to the SunPass account associated with your rental car. It’s a small price to pay to keep you on schedule and avoid any last minute panic. When you disembark from the cruise ship, there are plenty of taxis lined up waiting to transport cruisers to the airport, hotel or local car rental office. No need to pre-book your taxi; it will all be taken care of as part of your disembarkation process. Some taxi fares are fixed, such as to Miami International Airport, where you can find a wide choice of car rentals available. However, bear in mind you will pay an airport surcharge if you pick up your car rental from the airport. If you have already booked your Miami cruise port car rental from a local office in downtown Miami, you may need a taxi to get there. In that case, make sure the taxi has the meter running to ensure you are not overcharged. Some car rental companies provide shuttle buses to transfer customers between Miami cruise port and the car rental depot. Check out the section below to see which Miami cruise port car rentals offer this service. It may be free, or there may be a fixed price per passenger. It generally works out much cheaper for individuals to take the shuttle bus rather than paying for a taxi. Below you will find links to all main Miami cruise port car rental companies. We have included the lowest price for a one-day hire for comparison only. Dates, size of vehicle, and length of rental period will all affect the price. Sixt Rent-a-Car has two offices for car rentals close to Miami cruise terminals. The nearest is on SE 1st St in downtown Miami, just 5 minutes taxi ride from the port. The other office is at Miami International Airport which offers a shuttle service to and from the cruise port. Car rental prices start at $56.83 for one day’s car rental in a Kia Rio or similar. Enterprise has a car rental office near Miami cruise port at 400 SE 2nd St. It offers a pick-up service at non-airport locations, but you need to contact the rental office direct and make the arrangements. Prices start at $29.69 for a Mitsubishi Mitage one-day car rental. Other Enterprise offices can be found at the Doubletree Grand Hotel on N. Bayshore Drive in downtown Miami, at Miami International Airport, Fort Lauderdale International Airport, and at 1000 5th St on South Beach. These multiple options make Enterprise a good choice for one-way car rentals if you are flying into Fort Lauderdale Airport and want to drop off the car near the cruise port, or vice versa. The nearest Hertz car rental to Miami cruise port is at 228 SE 2nd St in downtown Miami. This is a dedicated office for the cruise port and it offers a convenient shuttle service for customers to and from the port. Other Hertz offices are at Miami Marriott Biscayne on Bayshore Drive; 530 Collins Ave in South Beach; Ritz Carlton on Key Biscayne; Miami International Airport and several other locations citywide. There is a shuttle service to and from the Miami cruise port. Car rental prices start from $32.55 for a Nissan Versa for one day. 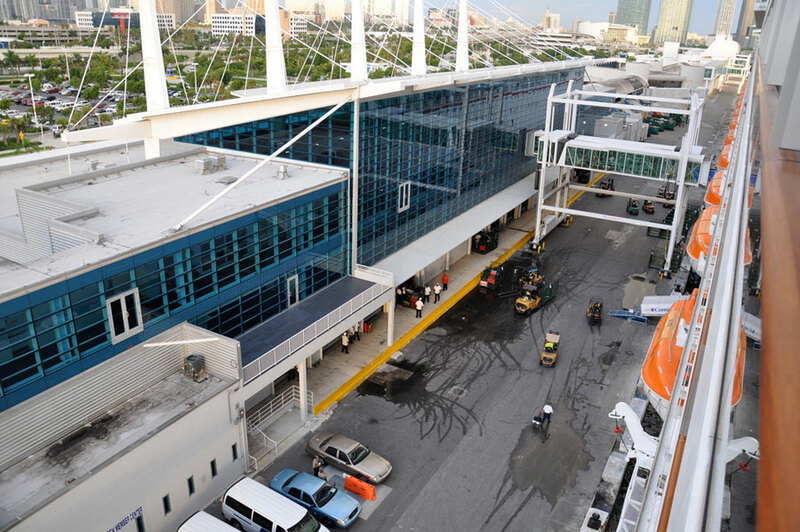 Thrifty also operates a dedicated Miami cruise port car rental office which includes a shuttle to and from the port. Based at 3900 NW25th St, the transfer time takes at least 20 minutes, depending on the traffic. You can book an economy car for $32.47 per day or opt for a Wild Card deal at $24.32 where the company picks whatever car is available (compact or larger). Budget offers Miami cruise port car rental services from several locations including Miami Airport and 89 SE 2nd St, which is the nearest depot to the port of Miami. Budget car rental includes a free customer pick-up service with a shuttle bus. Economy car hire starts at $28.99 per day for a Ford Fiesta or similar. If you want a larger vehicle, such as a Premium SUV, a Minivan for 7, 12 or 15 persons Enterprise has a full range of vehicles from $59 to $109 per day. Luxury car rentals near Miami port are also available. Opt for a Cadillac XTS from $79.69 or embrace the Miami sunshine with a Ford Mustang Convertible from $119.69 per day. You can also request a quote for Maserati, Jaguar XJ or similar executive luxury sedan to get you to and from the cruise port in style. Supreme Rent a Car offers luxury Miami cruise port car rentals with pick-up/drop-off locations near the cruise port as well as at Miami Airport, Fort Lauderdale Airport and Orlando Airport. Opt for a BMW M4 sports convertible at $159 a day, or perhaps a Cadillac Escalade is more your style at $255. You can even rent cars by the hour (minimum 4 hours) for a quick tour of Miami.